Entanglement occurs when groups of particles or waves are created or interact in such a way that the quantum state of each particle or wave cannot be described independently of the others, however far apart they are. Experiments performed at the University of São Paulo's Physics Institute (IF-USP) in Brazil have succeeded in entangling six light waves generated by a simple laser light source known as an optical parametric oscillator. Articles about these experiments have been published in Physical Review Letters ("Hexapartite entanglement in an above-threshold optical parametric oscillator") and Physical Review A ("Exploring six modes of an optical parametric oscillator"). The experiments are highlighted in a special news feature posted to the publications' website. "Our platform is capable of generating a massive entanglement of many optical modes with different but well-defined frequencies, as if connecting the nodes of a large network. The quantum states thus produced can be controlled by a single parameter: the power of the external laser that pumps the system," said Marcelo Martinelli, one of the coordinators of the experiments. Martinelli is a professor at IF-USP and the principal investigator for the Thematic Project "Exploring quantum information with atoms, crystals and chips" funded by São Paulo Research Foundation – FAPESP. The experiments were performed under the aegis of this Thematic Project. "Entanglement is a property that involves quantum correlations between distinct systems," Martinelli said. "These correlations are a major asset that can make quantum computers superior to traditional electronic computers in performing tasks such as simulations or prime number factoring, a critical operation for data security in today's world. For this reason, the creation of systems with multiple entangled components is an important challenge in implementing the ideas of quantum information theory." In previous research, the IF-USP team entangled two and three modes with the optical parametric oscillator. Their latest experiments have doubled the space available for information to be encoded. This idea is easier to understand through an analogy. The classical bit (binary digit) is a two-state system that can be in only one state at any given time – either zero or one. This is the basis of binary logic. The qubit (quantum bit) can represent a one, a zero or any quantum superposition of these two states, so it can encode more information than a classical bit. Entanglement corresponds to the nonlocal correlation of several qubits. Nonlocality is an intrinsic characteristic of nature and one of the key differences between quantum physics and classical physics, which recognizes only local correlations. Martinelli explained how this general principle is demonstrated in the experiments in question. "A laser supplies all the energy for the process," said the coordinator for the FAPESP Thematic Project. 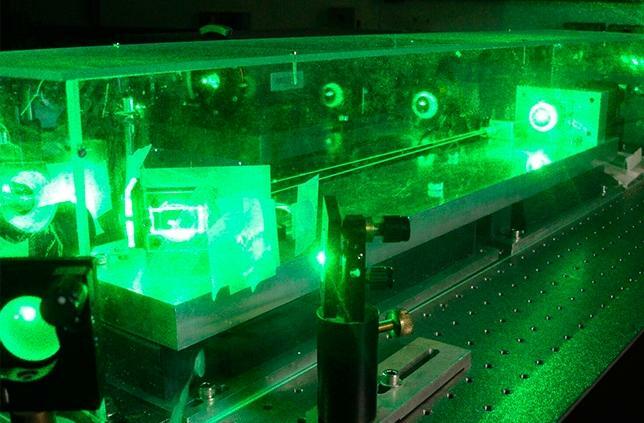 "The light beam produced by this laser hits a crystal and generates two other fields, which maintain the characteristics of the laser: intense monochrome light with well-defined frequencies. The system therefore now consists of three intense fields. Each intense field couples a pair of extremely weak fields, so that the six fields are coupled to the main field. The correlations between them are stronger than the correlations that are feasible if independent lasers are used." The device that generates the entangled states – the optical parametric oscillator – consists of a small crystal between two mirrors. The crystal is 1 cm long, and the distance between the mirrors is less than 5 cm. However, because cooling is a necessary condition for the process, the crystal and mirrors are placed inside an aluminum box in a vacuum to avoid condensation and to prevent the system from freezing. The information that can be encoded by a single wave is limited by the uncertainty principle. In this case, the wave amplitude and phase behave as analogues of particle position and velocity, the variables considered by Werner Heisenberg (1901-76) in formulating the principle. "With entanglement, part of the information in each particular wave is lost, but the global information in the system is preserved, in a shared form," Martinelli said. "Sharing means that when we observe a single wave, we're informed about the other five at the same time. Each beam goes to a detector, and this distribution of the information into independent units boosts the processing speed." The six waves comprise a set. When information is obtained from one wave, information is obtained on the entire system. When one is changed, the entire system is changed.